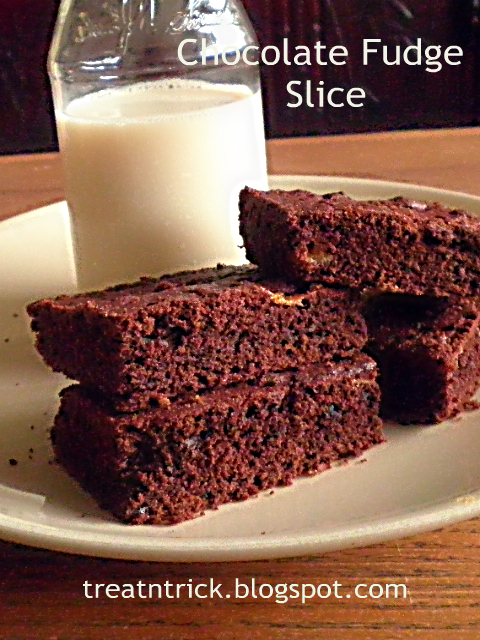 Who can resist Chocolate Fudge Slice? This recipe was foolproof and pretty darn simple - just basic ingredients and egg free. 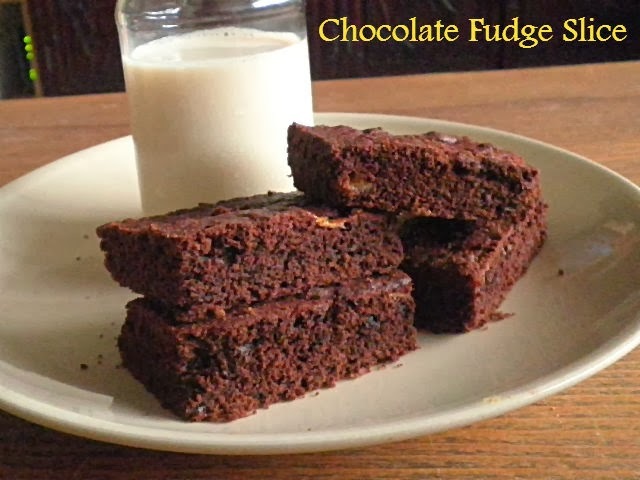 It's better than any fudge I've ever tried. I used 11 x 7 in rectangle pan, lightly buttered. The Chocolate Fudge Slice was easy to cut and remove from the pan. It's chocolatey and sweet enough to satisfy my cravings. Meanwhile, a lot of vegetarian cookery books rely heavily on eggs, especially for cakes, pastries and pudding. These recipes can be replaced and the following should provide some ideas. Eggs are used to bind a dish, when whipped, may also incorporate air making a cake very light. Many recipes can be adapted using one of the suggestions below. In the weekend, I set aside some personal time and baked this Coconut Cake. 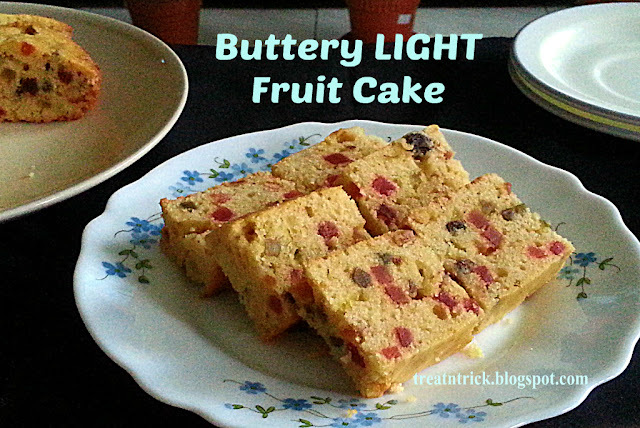 It is egg free recipe and truly fabulous. 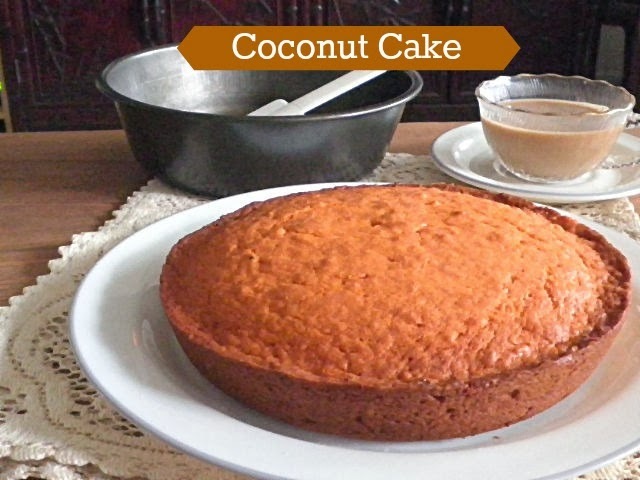 It is moist and smells so good loaded with shredded coconut. In case you have self rising flour in hand, you can use it but omit the baking soda and baking powder also you can add an egg, lightly beaten if you're not a fan of banana. My sons took a bite and declared this Coconut Cake as our delightful new favorite. There is no reason why you're not baking this cake. It is super easy, all you need was to throw the dry ingredients in a mixing bowl, mix well then fold in mashed banana, milk and vanilla extract. Stir to combine and pour into prepared pan and it is ready to be baked in a preheated oven for 20-25 minutes. 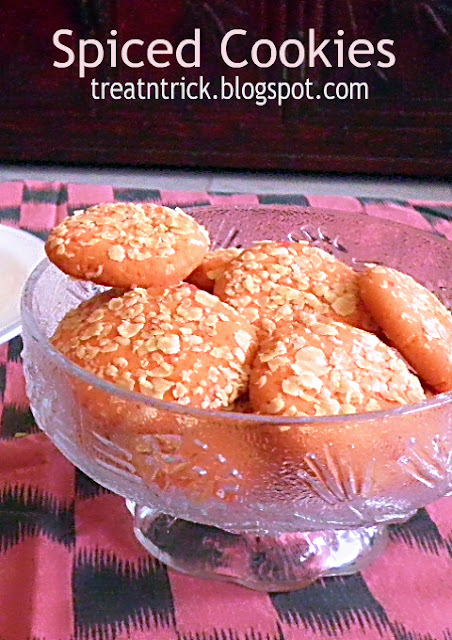 For most of my friends, cookies were served during festivals (Eid, Lunar New Year or Christmas) but not in my household. We are serving them regularly as our tea time treat. I recently bake these Spiced Cookies and my family raved about them because they are unusual and delicious. However this cookies is my to go. Simple, easy and loaded with warm spices. Would definitely prefer to bake in a smaller portion to maintain freshness but you can easily double up the quantity if needed. 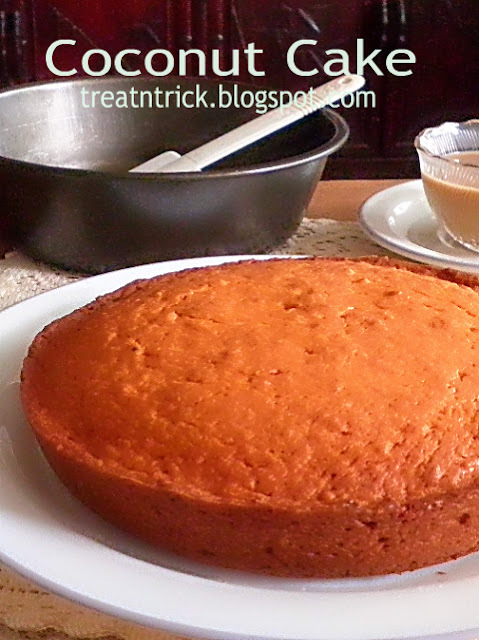 I also make use of orange colored sugar instead of white one. To speed up the process, you can leave the butter on your counter for few hours prior to baking or else use your microwave oven to soften it a little. Another combination of spices could be added to the dough are nutmeg, cinnamon or mixed spices. This is my first ever post of 2014. Although none in my family has issue with gluten but I always love to venture into something new. 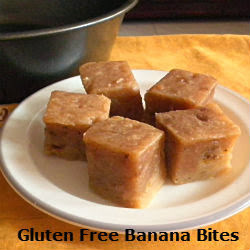 This time trying out Gluten Free Banana Bites. A gluten free diet strictly excludes gluten in all of its obvious and disguised forms. Gluten is a protein found naturally in wheat, rye, barley and spelt. As usual I had chosen a recipe that uses less sugar and egg free. If you need to clear your blackened banana, this recipe fits that purpose too. 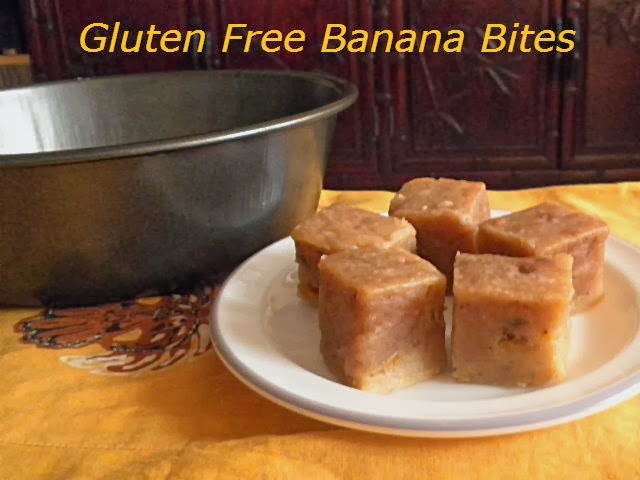 This gluten free and wheat free bites use corn flour and white rice flour with option to use either whole milk or coconut milk. It was wonderfully tasty with moistness from mashed banana and sliced beautifully when it was completely cool. Above all it is really quick and no fuss to prepare. Preheat oven @ 170 C and grease a 8 in cake pan. Combine milk, butter, salt and mashed banana. Place corn flour, brown sugar and rice flour in a mixing bowl. Add banana mixture to the dry ingredients, stir until well combined. Pour mixture onto prepared pan and bake for 35-40 minutes or until a skewer inserted comes out clean. When completely cool, cut into squares or thin slices to serve.